After more than a year of considering two different Capitol Hill endpoints for the First Hill Streetcar, both options still remain on the table. The Broadway Streetcar, formerly the Broadway extension, will run from E Denny to either Roy or Prospect to complete the northern section of the already-built First Hill Streetcar. Either way, city officials say they expect the line to be running by the start of 2017. According to the Seattle Department of Transportation, planning for the $25 million north Broadway section will be 30% complete by July. At that time SDOT is expected to make a final final decision on the terminus. The Prospect terminus was the most popular among respondents in a city survey conducted last year, garnering 64% of the non-scientific vote. The two-block extension past Roy would add $10 million onto the $25 million Broadway section and an Aloha option has been tabled. If funding for the line comes through as expected, construction would start at the end of 2015. 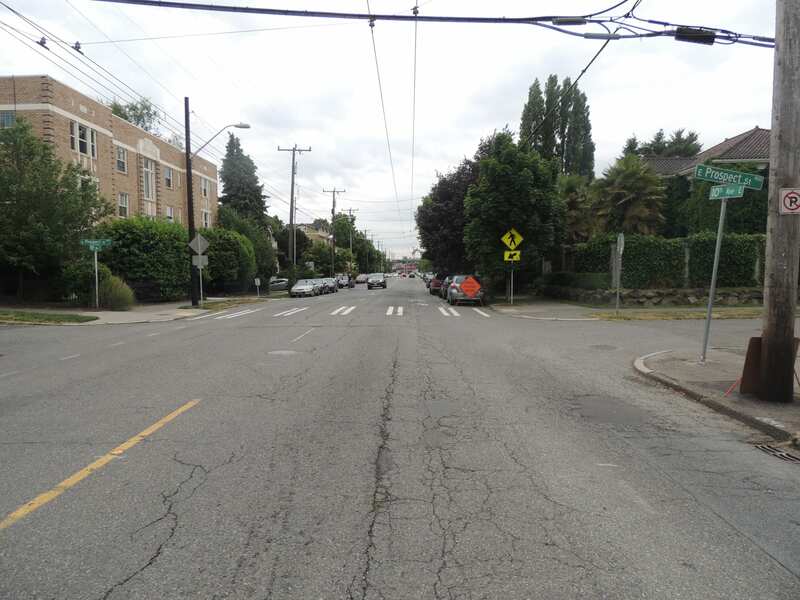 The neighborhood will have another chance to weigh in on the streetcar’s final Capitol Hill stop when SDOT holds a June 17th information session at Lowell Elementary. Last year the Seattle City Council approved plans for the city’s Transportation Benefit District spending, which included $175,000 for planning of the Broadway Streetcar Extension. The money “provides funding to complete formation activities for a Local Improvement District (LID).” CHS reported on the planning for the streetcar’s push for Volunteer Park here. Meanwhile, testing of the overhead lines powering the First Hill Streetcar is expected to begin soon. Earlier this year, CHS predicted the Pioneer Square-to-E Denny streetcar would open on September 4th, perfectly timed to shuttle Capitol Hill ticket holders to the Seahawks season opener at CenturyLink Field. SDOT’s Catherine Maggio informed us our September prediction was a little ambitious and that a November launch date is more likely. Sound Transit’s Capitol Hill Station and light rail extension, in the meanwhile, is slated to open for service in early 2016. For the above ground route, SDOT has completed all major construction on 2.5 mile streetcar line, and is now awaiting delivery of the cars after some failed a fire safety test earlier this year. Additionally, the Broadway bikeway has opened. This entry was posted in News, etc. and tagged broadway, streetcar, transit by Bryan Cohen. Bookmark the permalink. Bad idea. Corners are too sharp for trains to get around–would you remove the buildings on the corners so the track could run where needed?.And, trains can simply reverse; they can be driven from either end, unlike buses. I honestly don’t understand why you’d go past Roy St. Is that extra two blocks going to add a bunch of people who would use the streetcar? Probably a lot of better ways for the city to spend their money. Probably to make Volunteer Pk more accessible. That would be my guess. To me, it would be a shame if they didn’t go those two extra blocks. From a city planning standpoint, connecting Volunteer Park into the City’s street car line makes a lot of sense. There is a lot of investment (both public and private) going into the park over the next few years (including refurbishing the conservatory and a new “park within the park” when they put a lid on the reservoir). The timing seems ideal to connect right to the park. I think Aloha would be a better terminus point for the streetcar than Roy, since Broadway splits there – so, not so much about adding the extra distance (although there are plenty of people who live in that stretch north of Roy who may appreciate it), but logistics. I meant Prospect, not Aloha. Got distracted by the Aloha loop comments. Prospect does not make sense as a terminus. It’s not as though dropping people off at Prospect and 10th will put them right at the park. There is still a significant uphill climb on Prospect to the park. 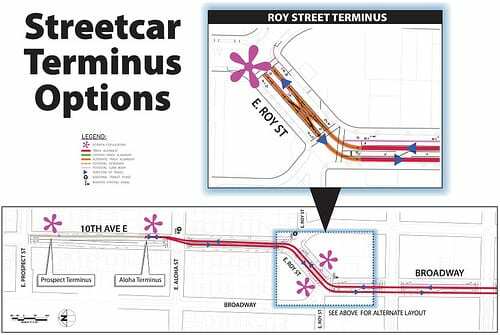 Also, Roy St. is nearby, and terminating the streetcar there will avoid a 40% increase for the extension. That’s huge! Another advantage of terminating at Roy is that traffic will not be slowed down at Aloha and 10th. Aloha is a major artery traveling East/West across the Hill. If you block that with a streetcar (or even prevent left hand turns onto Aloha from 10th), traffic on Boston and some other streets is probably going to increase dramatically. Go Directly To Roy. Do not Pass Roy! Also – does anybody know any details about the “Local Improvement District”. Is this an extra property tax for the businesses on Broadway, or will it hit homeowners and apartment owners elsewhere on Capital Hill? I completely agree. If it ended at Prospect, that is a ways from the main features of Volunteer Park (the SAAM, Conservatory), which is where tourists would be headed, and the Park is already served well by the bus line along 15th. If the streetcar ends at Roy, it is only a two block walk to Prospect, and it’s flat., so taking it to Prospect adds very little as far as accessibility. Save the extra $10 million and choose the Roy terminus! This should be a great opportunity to redesign some of these intersections on Broadway to be more pedestrian-friendly, and to encourage more pedestrian traffic on Broadway. Does anyone know if anyone is advocating for this? e.g. almost every time I visit Broadway & John, I observe a reckless driver nearly run someone over. Broadway and John needs to be reconfigured to accommodate cars who need to turn left and drivers going around those who are needing to turn. That and cars trying to beat the red light camera (as well as careless pedestrians) make it a dangerous intersection. I’m surprised there are not more accidents there. The Roy terminus also has the added benefit of not laying extra tracks in the street that bicyclists have to cross at an awkward angle. The comments here advocating for a Roy Street stop make some good points. But I believe the benefits of adding the extra two blocks (technically closer to three blocks, per feet) outweigh concerns about cyclist inconvenience (I’m a cyclist; it’s not that big a deal to cross trolley tracks) or disrupting the light at Prospect (the plans do not have the streetcar “blocking” the intersection). It is an expensive extension, but the two extra blocks will create a boost in visitors, including tourists and their dollars, to Volunteer Park. The extra two blocks are an expense that will possibly be made later (at more expense) when the streetcar ideally continues on to Eastlake and beyond. I seriously doubt that the extension will create an increase in tourists to Volunteer Park. If they really want to take the streetcar (a very indirect way to get there, with the routing as it is, starting from the ID), they can get off at Roy and walk the 2 (flat) blocks to Prospect. Or better yet, they can take the bus which runs along 15th, and which provides closer access to the central part of the Park.